ALL SpeechPage Materials Are Made In The USA! We were formed in 2005! ALL SpeechPage.com Publishing Co. Materials Are Written, Designed, Drawn and Illustrated Exclusively by Don D'Amore M.A. CCC-SLP a licensed and ASHA Certified Speech/Language Pathologist with Over 25 years of Experience working with individuals with a wide variety of disabilities, including both school age and adult clients. Don D'Amore M.A. CCC-SLP has extensive experience with Augmentative/Alternative Communication (AAC) and with communication strategies for individuals with Autism Spectrum Disorder. Don D'Amore has presented regularly for over 20 years at speech language pathology conventions and at other SLP and educator gatherings. He has co-presented at the American Speech Language and Hearing Association (ASHA) Annual Convention, and he has presented or co-presented numerous times at both the Ohio Speech Language and Hearing Association (OSLHA) Annual Convention, and the Ohio School Speech Pathology Educational Audiology Coalition (OSSPEAC) Annual Convention. 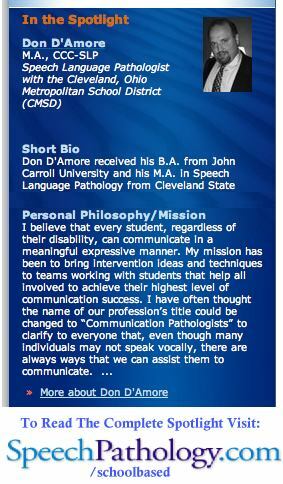 Don D'Amore has an Ohio License of Speech Language Pathology as well as a Permanent Ohio Teaching Certificate. He has been a member for more than 24 years of both American Speech Language and Hearing Association (ASHA) and the Ohio Speech Language and Hearing Association (OSLHA) and has been published in the OSLHA HEARSAY Journal of Speech Language Pathology and Audiology. Don D'Amore is a past president of the North Eastern Ohio Speech Language and Hearing Association (NEOSHA) as well as a multiyear member of that organization's Executive Board. ••• Don D'Amore was chosen to be the 2009 recipient of the annual Award: "Honors Of The Ohio School Speech Pathology Educational Audiology Coalition!" Every SpeechPage is 100% Written, Designed, AND ILLUSTRATED by the SLP! 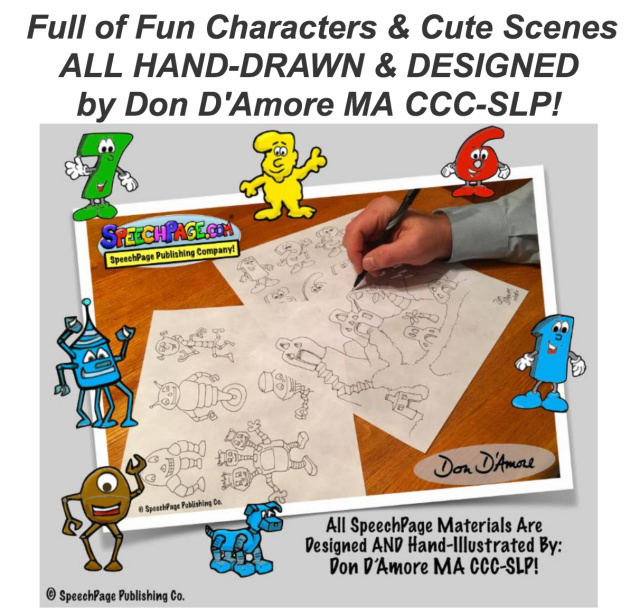 SpeechPage Publishing Co. materials are a cumulative result of over two decades that Don D'Amore MA CCC-SLP has invested of his own time and efforts designing and illustrating Fun & Effective Speech & Language therapy materials that SLPs and their clients JUST LOVE! WE NEVER USE A CLIP ART PROGRAM OR ANY GENERIC ART SOURCE! THE EXPERIENCED SLP ILLUSTRATES ABSOLUTELY EVERYTHING! THAT IS THE ONLY WAY TO MAKE SURE EVERY PICTURE ON EVERY SPEECHPAGE IS EXACTLY WHAT THE SLP WANTED IT TO BE! Don D'Amore has also been informally illustrating and drawing his whole adult life. Don does some freelance professional graphic art work and he has recently professionally illustrated work for two published books. "Honors Of The Ohio School Speech Pathology Educational Audiology Coalition!" Don was deeply honored and humbled to accept this annual state wide Speech Language Pathology Honors of the Profession Award. Don acknowledged that:"Ohio has thousands of hard working Speech Language Pathologists & Audiologist that are unsung heros, and that go above and beyond their job descriptions to help their clients. We should recognize all of these hardworking professionals!" Don D'Amore MA CCC-SLP has been put IN THE SPOTLIGHT! by the popular website SpeechPathology.com! He was chosen as a School-Based Speech Pathologist to be put in their "Spotlight", a feature that highlights different Speech Language Pathologists throughout the United States! Don D'Amore was invited by colleagues from Cleveland State University’s Department of Speech and Language Pathology to co-present an almost five-hour teleconference in August 2016 to Barbado’s Special Education Staff and families of children with special needs! The Teleconference session title was: “Retooling Your Toolbox: Effective Communication Strategies For Students With ASD.” It was a rewarding venture and Don hopes to travel with CSU staff and graduate students to Barbados in the future to work directly with the people there on strategies to improve the communication skills of their special needs children. 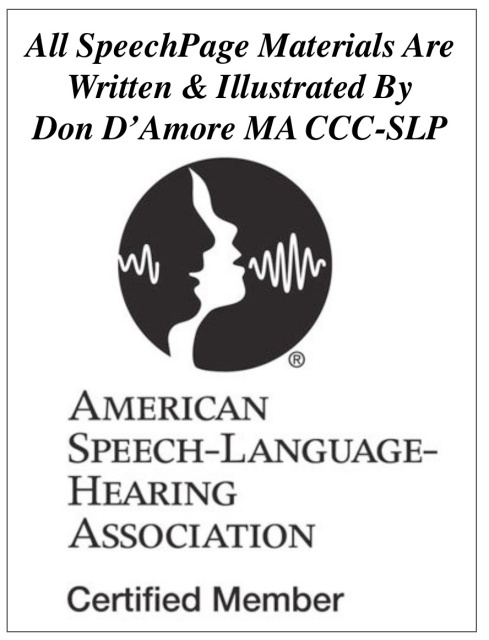 2018: October 2018 Don D’Amore MA MA CCC-SLP was awarded his Second American Speech Language and Hearing Association (ASHA) ACE AWARD! 2016: In addition to Don's Barbados presentation mentioned above in 2016 we Sponsored our 4th, 5th AND 6th ASHA ONLINE CONFERENCES THIS YEAR: "Collaboration for Preschool Language & Literacy!" and Two "speech Sounds" conferences! The feedback we received from our 'virtual booth' was wonderful! Great to see postings from new SLPs interested in our products as well as from past happy customers! 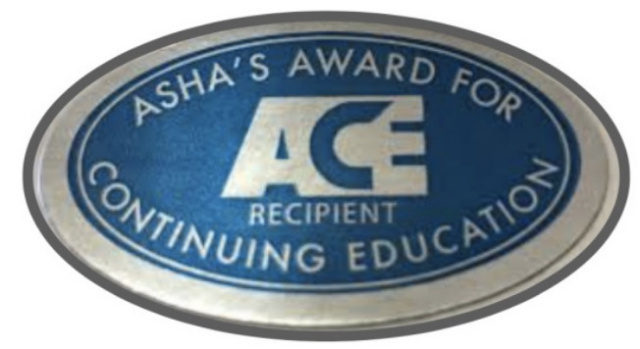 We hope to sponsor many more ASHA Online Sessions! 2015: Brought us up north to the Michigan Speech Language Hearing Association Annual Conference in Lansing! It was nice to meet so many Michigan SLPs! We also had another great year with our double sized booth at Ohio's OSSPEAC in Columbus again! What a great annual conference for School Based SLPs! 2014: It was wonderful meeting all the many SLP, Undergrads and Grad Students at the National Student Speech Language Hearing Association (NSSLHA) conference in Akron October 11, 2014! We had THREE WINNERS of our booth raffle! We had a great time in PITTSBURGH FOR ASHA SCHOOLS July 2014! Thanks to the many many SpeechPage Insiders that stopped by our booth and connected with us again! We were in Pitts SEVEN years ago for the same conference! Time has flown! 2013: WE JUST LOVE OSSPEAC SLPs! WE LOVE OHIO AND ALL OHIO SLPs! OSLHA AND OSSPEAC! SpeechPage.com Publishing Co. has had booths at the Ohio School Speech Pathology Educational Audiology Coalition (OSSPEAC) Annual Conference in Columbus Ohio in 2007, 2008, 2009, 2013 & 2015! Thank you to all the many Ohio SpeechPage INSIDERS that stopped by our booth and said "Hello!" We were overwhelmed with the response to our products-- yet again! For the past few years we have really enjoyed meeting all the local Ohio School Based SLPs each Fall at the Ohio School Speech Pathology Educational Audiology Coalition (OSSPEAC) Annual Convention! 2012: We were humbled by the record number of SpeechPage INSIDERS that stopped by our booth and shared so many nice comments on our materials at the SUMMER's ASHA Schools 2012 in Milwaukee Wisconsin! It was held July 27-29, and it was well worth the trip out west! (We were glad to have had three people working our booth for that event! 2012: We loved meeting you all once again at the annual 2012 Ohio Speech Language and Hearing Association's (OSLHA) Annual Conference in Columbus Ohio! We hope our Double Sized Booth helped you with the crowds around our table! 2011: We had a great time meeting so many SLPs again at our vendor booth at ASHA SCHOOLS 2011 in Washington DC! We loved to hear first hand from you on how our products are working out for your clients! 2010: SpeechPage.com Publishing Co. had THREE booths at the Ohio Speech Language and Hearing Association's (OSLHA) Annual Conference in Columbus Ohio in March 2010!SpeechPage.com Publishing Co. had two booths at the Ohio Speech Language and Hearing Association's (OSLHA) Annual Conference in Columbus Ohio in March 2010! OSLHA Contacted SpeechPage Publishing and informed them that their members specifically requested our company to be a vendor at their 1200 attendee conference. The DOUBLE sized booth area helped out a lot to prevent the over crowding that has occurred at other conferences! 2009 INDIANA: SpeechPage.com Publishing Co. Had A Booth at the Indiana Speech-Language-Hearing Association (ISHA) Convention March 26-28, 2009 in Indianapolis! It was our first time at that convention and we enjoyed the whole event! 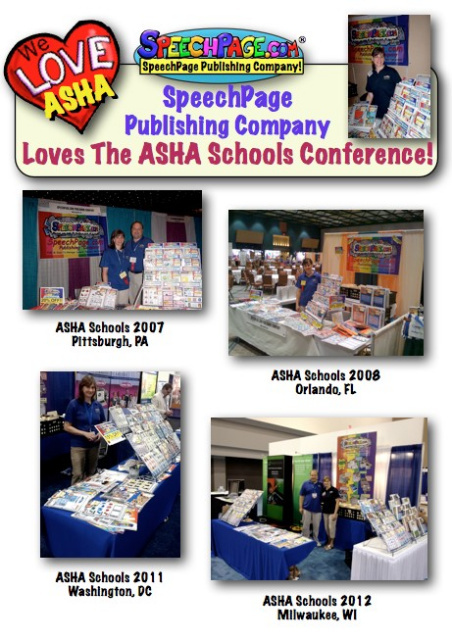 2008: SpeechPage.com Publishing Company once again had a Booth at ASHA School's 2008 Conference held in Orlando Florida! It was wonderful meeting a record number of SpeechPage Insider Email Subscribers that stopped by our booth! We hope you are enjoying the gifts we gave out to those that identified themselves as Insiders! That ASHA Disney World Conference on July 25 to 27, 2008 was FUN!! 2007: ASHA Schools 2007! WHAT A HUGE EVENT! The annual conference for school-based SLP's Friday, July 13– Sunday, July 15, 2007 @ David L. Lawrence Convention Center Pittsburgh, Pennsylvania! We sold out of any sets! SpeechPage.com Publishing Had A Booth at the Ohio School Speech Pathology Educational Audiology Coalition (OSSPEAC) Annual Convention NOVEMBER 2007 Akron Ohio! 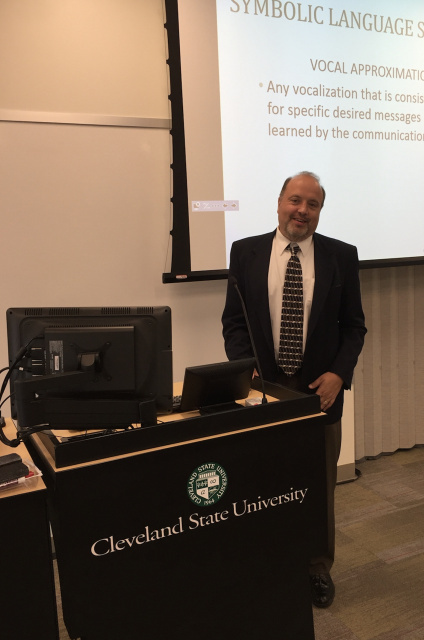 2016: Don D'Amore was invited by two colleagues from Cleveland State University’s Department of Speech and Language Pathology to co-present an almost five-hour teleconference in August 2016 to Barbado’s Special Education Staff and families of children with special needs! The Teleconference session title was: “Retooling Your Toolbox: Effective Communication Strategies For Students With ASD.” It was a rewarding venture and Don hopes to travel with CSU staff to Barbados in the future to work directly with the people there on strategies to improve the communication skills of their special needs children. Don D'Amore was invited to present in March 2014 for the first time at the Conference for Exceptional Children - Ohio Annual Convention in Columbus Ohio! Don's topic: Visual Strategies to Enhance Communication and Positive Behaviors In The Classroom! 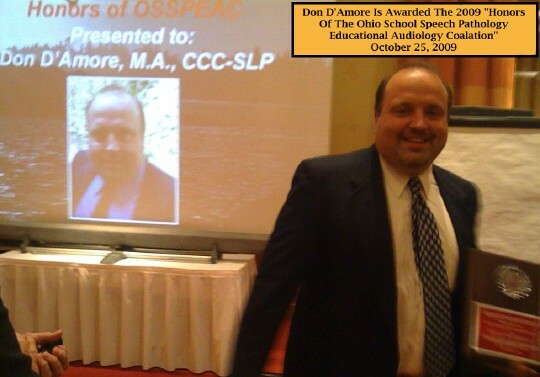 Don D'Amore was invited to present again at the Ohio School Speech Pathology Educational Audiology Coalition (OSSPEAC) Annual Conference in Columbus Ohio on October 2011! Don Co-Presented two sessions this year on the topic of real life AAC therapy strategies. Don D'Amore co-presented again at the Ohio School Speech Pathology Educational Audiology Coalition (OSSPEAC) Annual Conference in Columbus Ohio on October 25, 2010. The topic was: Giving AAC Legs To Stand On: Solutions for Wobbling Interventions! CONTACTING US NOTE: Please email all business related inquiries to: Michelle (at) SpeechPage.com. Michelle runs the daily operations of SpeechPage.com Publishing Co. and she will work with you to quickly resolve any issues or questions. Michelle can answer questions about products and policies, and also set up contracts with distributors. Currently SpeechPage materials are carried by a variety of national companies that specialize in marketing these types of therapy material. Your best value for purchasing SpeechPage Publishing Co. products are directly through our website or catalog. It has been a career long goal of Don D'Amore to combine his knowledge of Speech Language Pathology with his illustration skills and his ability to plan Creative, Fun and Effective therapy session to produce SLP materials made entirely by an SLP for SLPs! The results benefit untold numbers of clients, and that is the ultimate reward of this venture. We know of no other line of Speech Therapy Materials that are Illustrated, Written, and Designed entirely by the experienced Speech Language Pathologist alone. It is what make SpeechPage.com Publishing Co. products Unique, Practical, FUN and Effective. Like So Many SLPs around the country You Will Love Your SpeechPages! ALL OF OUR SPEECHPAGES ARE MADE IN THE UNITED STATES OF AMERICA!! It might increase our profit a bit to have publication or assembly of our products done overseas but we believe in keeping America strong! We love the fact that all of our Speech Therapy Materials our 100% American made! SpeechPages are perfect for when you need REAL HANDS-ON-Learning Speech & Language Therapy Materials and not just another App! Don't your clients get enough 'screen-time' in their life? SpeechPages allow clients to interact with their clinician and not a screen during thier valuable Speech Therapy time! If you represent a serious buyer for one or more of these popular and powerful internet domain names please contact us for further details on the purchase of the domain. If we determine it is still available for sale at the time of contact we will work with you to determine a fair cost. UNDER NO CIRCUMSTANCES, SHALL SPEECHPAGE.COM PUBLISHING CO. OR ANY OF THEIR EMPLOYEES, DIRECTORS, OFFICERS, AGENTS, VENDORS OR SUPPLIERS BE LIABLE FOR ANY DIRECT OR INDIRECT LOSSES OR DAMAGES ARISING OUT OF OR IN CONNECTION WITH THE USE OF OR INABILITY TO USE THE SPEECHPAGE.COM WEB SITE. THIS IS A COMPREHENSIVE LIMITATION OF LIABILITY THAT APPLIES TO ALL LOSSES AND DAMAGES OF ANY KIND (WHETHER GENERAL, SPECIAL, CONSEQUENTIAL, INCIDENTAL, EXEMPLARY OR OTHERWISE, INCLUDING, WITHOUT LIMITATION, LOSS OF DATA, INCOME OR PROFITS), WHETHER IN CONTRACT, NEGLIGENCE OR OTHER TORTIOUS ACTION, EVEN IF AN AUTHORIZED REPRESENTATIVE OF SPEECHPAGE.COM PUBLISHING CO. HAS BEEN ADVISED OF OR SHOULD HAVE KNOWN OF THE POSSIBILITY OF SUCH DAMAGES. IF YOU ARE DISSATISFIED WITH THE SPEECHPAGE.COM WEBSITE OR ANY CONTENT ON THE SITE, OR WITH THE SPEECHPAGE.COM TERMS AND CONDITIONS, YOUR SOLE AND EXCLUSIVE REMEDY IS TO DISCONTINUE USING THE SPEECHPAGE.COM WEBSITE. YOU ACKNOWLEDGE, BY YOUR USE OF THE SPEECHPAGE.COM WEBSITE, THAT YOUR USE OF THE SITE IS AT YOUR SOLE RISK. BY ACCESSING AND USING THE SPEECHPAGE.COM WEBSITE, YOU AGREE THAT YOUR ACCESS TO AND USE OF THE SPEECHPAGE.COM WEBSITE IS SUBJECT TO THESE TERMS AND CONDITIONS, AS WELL AS ALL APPLICABLE LAWS, AS GOVERNED AND INTERPRETED PURSUANT TO THE LAWS OF THE STATE OF OHIO, UNITED STATES OF AMERICA. 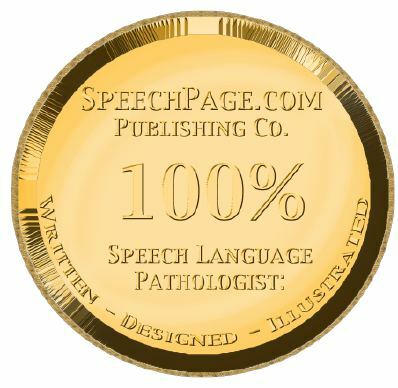 The Mission of SpeechPage.com Publishing Company is to help improve the lives of the clients served by Speech Language Pathologists (SLPs) by providing Clinicians with an excellent source of fun and easy to manage Speech and Language Therapy materials. • Be fun and colorful and with easy to recognize illustrations that your clients enjoy using! • Be useful in many different ways because we recognize that EVERYone of your clients is special and has different goals and needs. You need FLEXIBLE sources of stimulus therapy materials that you can use for a variety of purposes based on your professional judgment. • Be delivered quickly and available at the most reasonable cost as possible. We have gone to great efforts to show and describe to you on our website exactly what you will get. (We do not just print the name and show one sample page. We try to show at least part of the other pages you will get!) Our goal is to help you to know what you are ordering--a great Speech/Language material from an honest & open company! Because of this policy, returns are extreamly rare! We hope you find SpeechPages fun and motivating for your students and clients! NO GENERIC CLIP ART FROM A CD OR FROM THE INTERNET! Frustrated with some materials that rely on generic 'clip art' for their source material? They may be cheaper or even free, but are they truly effective or very helpful? Have you noticed that some of the individuals who you work with may not recognize generalized or vague 'clip art' or simple line drawn images from a CD-Rom collection or from an internet search. It is no wonder! Clip art collections may have been designed for very different purposes such as illustrating a company newsletter, or for another purpose and NOT as a Speech Therapy stimulus tool. Some clip art is simple while another is complex. Every illustration on a SpeechPage material was drawn by the SLP and DESIGNED SPECIFICALLY FOR THESE PURPOSES. SpeechPage Publishing was the exclusive Sponsor of the website SchoolBasedSLP.com. It is hoped that SchoolBasedSLP.com will resume in the near future, once again offering Hard Working School Based SLPs free resources to assist them with their challenging profession! Any information presented on the SpeechPage.com website should not be used as a substitute for the advice of your Speech Language Pathologist, Doctor, or other health care provider. Although we have taken great care in compiling the information SpeechPage.com, the information on this site is intended for guidance of the qualified SLP customer to understand offered materials for speech/language therapy only. We cannot be held responsible for any losses due to incorrect information, or any inaccuracies in the information provided on the SpeechPage.com Web site or its products. SpeechPage.com® AND THE SpeechPage.com® LOGO ARE AN OFFICIAL REGISTERED TRADEMARK ON FILE WITH THE UNITED STATES PATENT AND TRADEMARK OFFICE. All content including copy, text, graphics, logos, images, pictures of products, product names, and company names appearing on the SpeechPage.com web sites are original work produced by and is the sole property of SpeechPage.com and is protected by U.S. Copyright and International Trademark laws. They may not be reproduced, copied, down loaded or used in any manner without the sole written permission of SpeechPage.com. SpeechPage.com makes no warranties expressed or implied, including any implied warranties of merchantability and fitness for a particular purpose. Speech Language therapy can only be done by a qualified and certified Speech Language Pathologist. Users are responsible for applying professional judgment in the application of ideas obtained from this site or the products contained within. The clinician's competence with professional therapy methods is assumed. All materials are sole property of SpeechPage.com and are not endorsed, sponsored by, or associated with any other company or affiliation. It is the sole responsibility of the consumer to determine the suitability or appropriateness of products/downloads from SpeechPage.com for use in their particular application and assumes all liability and risk associated with their use. SpeechPage.com offer no guarantees, expressed or implied, as to the reliability or effectiveness of products or the content of this site. SpeechPage.com expressly disclaims all warranties not stated in this limited warranty. It is the responsibility of the consumer to determine the suitability of products from SpeechPage Publishing Company, for use in their particular application. The consumer is solely responsible for the proper use of these products and assumes all liability and risk associated with their use. SpeechPage.com Publishing Co. retains all proprietary rights, copyrights and all other rights relating to any content on this site. Permission is only granted to download and print a small number of copies of the content og the FREE STUFF area for personal educational uses by qualified professionals. You may never sell, transmit, distribute, transfer, reproduce, perform or display such content for any commercial purpose, whatsoever, at any time. Any material's potential for used for a specific client is of course dependent on the many unique aspects regarding the individual,such as age, disability, abilities and other relevant factors. SpeechPage.com Publishing Co. website and materials sold contain general information, and content is not intended to be and is not complete, is not medical advice, and does not replace professional medical care and physician advice, or any other professional advice or service, which always should be sought for any specific condition. SpeechPage.com Publishing Co. specifically disclaims all responsibility for any liability, loss, or risk, personal or otherwise, damages (actual or consequential), based on any legal theory whatsoever, alleged to have been incurred as a result, directly or indirectly, of the use of any of the material herein. SpeechPage.com Publishing Co is not responsible for any typographical or accidental errors in product descriptions or pricing. Sign-Up for our Email Newsletter for great deals, new products, free downloads and price drop alerts! Please Like Us On FACEBOOK for Facebook-Only Specials and announcements! Follow us on TWITTER and Pin Us on PINTEREST!